CMRL Recruitment 2019 - Job notification for General Manager (Track & Elevated Construction) Post in CMRL, Chennai, Tamil Nadu on Deputation Basis. 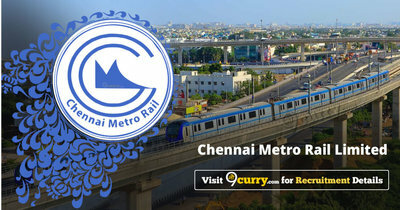 Applications are invited by Chennai Metro Rail Limited on or before 25 Feb 2019 for 1 vacancy. 55 years as on 19-12-2018. IRSE Officers (in Group A) presently in SAG and above level with minimum 16 years of experience in Railways / Metros / Central Govt. Organization. (i) The deputationist shall be entitled to draw pay being drawn in the parent organization. Additionally, deputation allowance and project allowance at 10% of Basic Pay each will be paid. (ii) Option to draw pay and allowances as per the parent organization or to draw equivalent cadre pay scale in CMRL with IDA, HRA and cafeteria allowances of 20% of Basic pay.